I bought Paul Hollywood’s 100 Great Breads few months ago when I was in a serious bread-baking mood. 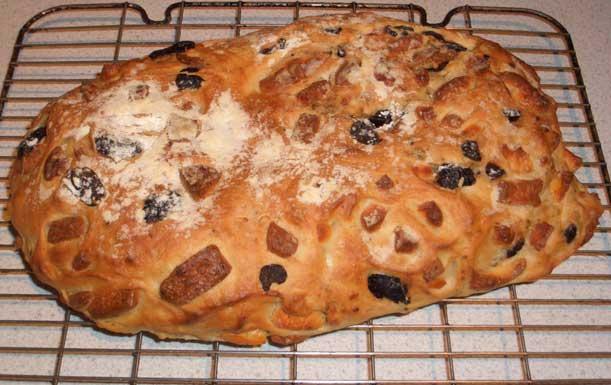 I had used his recipe for the Greek and Cypriot Easter bread Tsoureki during the Orthodox Easter this May, though back then I didn’t manage to find mahlepi (sour cherry pits) nor mastic (gum resin from mastic tree) anywhere in Edinburgh. I’ve since then managed to buy some in a small Greek shop in London, Bayswater* and am looking forward to baking with these unusual spices (Hollywood has recipes for Cypriot village bread koulouri, and Cypriot Laganes Bread, and I’m also looking forward to trying tsoureki again, this time with all the seasonings; I’ve found several recipes using mahlepi and mastic in Susanna Hoffman's The Olive and The Caper, and Claudia Roden mentions these as well). Paul Hollywood’s book is alright, with quite a few interesting looking and unusual bread recipes that I’m tempted to try. It has a short introductory chapter about the history of bread and some useful breadbaking hints and tips, but it’s a book for wide rather than specialist audience. 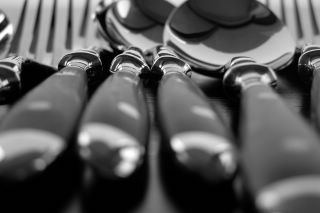 I suspect lots of the recipes have been simplified, which is good, especially if you’re looking something easy to bake on a spur of the moment late at night. However, I have a feeling that recipes have not always been properly tested and the editing is poor as well. Think of the above mentioned mastic and mahlepi. On page 78 Hollywood specifies that ‘mastika and mechlebe are spices and seeds used in many Greek/Cypriot dishes. They have a similar flavour to fennel or aniseed, which you can use to replace them. However, most good health food shops will stock them’. But in the Index of the book there are entries for ‘meclebe’ and ‘methlepi’!?!? How did they get the spelling wrong twice and didn’t it occur to them that ‘meclebe’ and ‘methlepi’ are the same thing and should actually be spelt ‘mechlebi’, as it was in the recipes? Or maybe mahlepi, as it is usually spelt in English. Incorrect spelling and amounts aside, the recipes are tempting. The first recipe I tried was Halloumi and Mint Bread (p 80). I quite enjoyed the recipe, though again, I think the recipe wasn’t correct. Trying to mix 2 packets – that’s 500 grams – of chopped halloumi cheese into a dough made with 500 grams of flour is ambitious. I also think that 20 grams of dried mint (that’s 4 commercial glass spice pots!!!) is outrageous, especially as on the accompanying photo the bread is anything but full of mint (I simply omitted the ‘0’ from the recipe). I’ve also more than halved the amount of salt in the recipe, as cheese is quite salty already**. I suspect that Paul Hollywood’s recipe was originally for more than 1 loaf and while reducing the amount of flour, amounts for some of the other ingredients have remained unchanged. 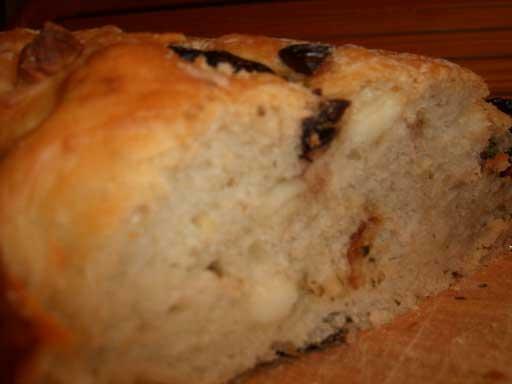 But the bread itself is easy and tasty, soft and dense at the same time and duly recommended. I think I’ve got the amounts correct here. Mix flour, salt, olive oil and yeast in a big bowl, adding water gradually (you may need less, as you’re just trying to bring the ingredients together). Knead for about 8 minutes (or 5, if you are using a mixer). Cover the bowl with a clean towel or clingfilm and leave to rise for 1 hour. 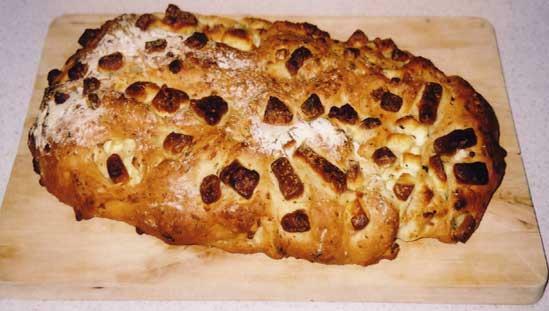 Add the cheese and dried mint to the dough and shape into a longish loaf. Lift to the baking tray and leave to rise for another hour. Dust the top of the loaf with some flour and bake in a preheated 220˚C/425˚F oven for 25-30 minutes. The bread should be golden brown and crisp on the top. Transfer to a wire rack to cool, and cover with a kitchen towel if you want just slightly softer top. It's almost time for lunch now, so I'm going to have some of the halloumi, olive, mint and oregano bread with some tea..
Good adaptation of that recipe. I'm a big fan of Paul Hollywood. Watching him on TV was how I finally got a good technique for kneading dough. Before that, I think it was rather embarassing to have anyone watch me! The bread looks great. It would have been a disaster if I had been using that cookbook, my bread would have been green and runny with all the mint and cheese I would have thrown in there. :) But your end result looks wonderful! J - I'm a recent convert to halloumi as well. At first I found it far too rubbery, but now I like the way the cheese retains some bite after baking/grilling/frying. Michele - I guess few years ago I would have tried much harder to knead all 500 grams of cheese and 20 grams of mint into the dough, as I was more strict in following recipe instructions. But you learn to be slightly sceptical as you become more confident. Especially with cheese the previous time it just seemed so obviously too much - there wasn't just enough dough, and I kept eating the halloumi pieces that wouldn't fit in:) Thank you for your kind words. 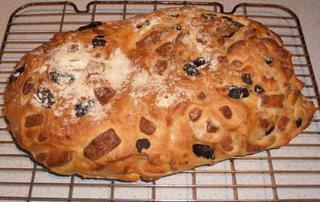 today I wrote an entry of a loaf (farl) from Paul Holywood's "100 Great Breads". While googling I stumbled upon the bread you baked. It really looks good! I also find the amount of salt way to much (normally I use 2% - baker's percent) and will reduce it in my next tries. I have been looking for a while for a good halloumi bread recipe, and I think this is a really good one, so the search is off! However, what do you mean by 2/3 "DL" warm water?? The results were great - I divided the dough mixture into three smaller loafs, and baked for 20 mins which seemed to work well. I also grated half of the halloumi and diced the other half, so the cheese flavour is distributed a bit more. If anything no salt is needed, as the halloumi is very salty in itself. Anon. - it's 2-3 dl aka decilitres or 200-300 ml or just under or over a cup (250 ml). I LOVE the idea of grating half of the cheese, thank you!! Will try it again soon - and use less salt! Pille - thank you. By the way, I was very reassured when I read your comment about the quantities in Paul Hollywood's recipe not being quite right. Having followed that recipe to the letter, I thought I had made a mistake somewhere! Your blog is great.